Scoliosis is an abnormal curvature of the spine, or backbone. Instead of a straight vertical line from the neck to the buttocks, the spine has a C- or S-shape. Scoliosis may also be described as infantile, juvenile, or adolescent based on the child's age at onset. Children may also have kyphosis, which is an abnormal forward curve, usually the upper back. The different types of scoliosis have different causes. Factors that may increase your child's risk of developing syndromic scoliosis include having conditions that affect muscles and nerves, such as muscular dystrophy or cerebral palsy . Idiopathic scoliosis is more common during the rapid growth phase of adolescence. Family history of scoliosis may also increase your child's chance of developing scoliosis. In most cases, scoliosis doesn't have symptoms that can be felt. It is generally detected during a screening test or doctor's visit, but may be noticed by the child or another person. Some schools have scoliosis screening programs . If scoliosis is detected in school, you will be advised to follow-up with your doctor. Assess level and pace of bone development. Your child's doctor may recommend other tests to see if the scoliosis is caused by an underlying health condition. Functional scoliosis is reversible with treatment of the underlying condition. 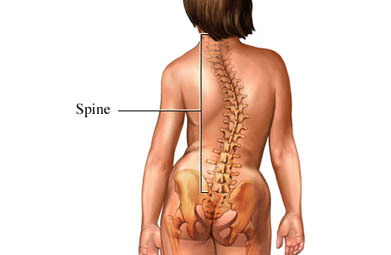 Children with structural types of scoliosis will be referred to a spinal specialist if treatment is needed. In general, children with a mild curve are treated with observation. This means your child will have regular follow-up exams and sometimes x-rays to see if the curve worsens. Frequency of follow-up appointments depends on age, stage of growth, and the severity of the curve. Physical therapy may be helpful to manage pain and optimize your child’s function. The goal of bracing or casting is to prevent curves from getting worse. The doctor may recommend that your child wear a back brace or a cast if they are still growing and the curve is more than 20-25 degrees, but less than 40 degrees or has progressed more than 10 degrees. Once growing stops, the need for more treatment will depend on the size of the curve and how it affects your child's appearance and function. Physiotherapy scoliosis-specific exercises may also be advised. Bracing may not be helpful in girls who have had their period for more than a year, in children who have attained full growth, or are within one year of full pelvic bone growth. It may not be helpful in infants as well. Bracing will feel uncomfortable at first. Children will need lots of support to wear the brace as prescribed, as well as encouragement to foster a positive body image. In severe cases where the curvature is greater than 40-45 degrees, your child's doctor may advise surgery to lessen the curve or stop it from worsening if they are still growing. If they are done or almost done growing, it may be recommended for a curve greater than 50 degrees. Surgery in teenagers typically involves fusing the vertebrae of the spine together or the use of internal rods to decrease the curvature. Surgery in younger children usually does not involve fusion and may use rods that can be lengthened as your child grows. Hospitalization can last 5-7 days. Recovery can take several months. Surgical techniques using stapling methods or implants, as well as other surgical techniques, are also available, but some are still experimental. There are no current guidelines for preventing scoliosis because the cause is usually unknown. Adolescent idiopathic scoliosis. EBSCO DynaMed Plus website. Available at: http://www.dynamed.com/topics/dmp~AN~T116647/Adolescent-idiopathic-scoliosis . Updated January 19, 2016. Accessed November 27, 2017. Altaf F, Gibson A, et al. Adolescent idiopathic scoliosis. BMJ. 2013;346:f2508. Congenital scoliosis and kyphosis. EBSCO DynaMed Plus website. Available at: http://www.dynamed.com/topics/dmp~AN~T908760 . Updated January 19, 2016. Accessed November 27, 2017. Idiopathic scoliosis in children and adolescents. American Academy of Orthopedic Surgeons Ortho Info website. Available at: http://orthoinfo.aaos.org/topic.cfm?topic=A00353. Updated March 2015. Accessed November 27, 2017. Infantile and juvenile idiopathic scoliosis. EBSCO DynaMed Plus website. Available at: http://www.dynamed.com/topics/dmp~AN~T908759 . Updated July 13, 2016. Accessed November 27, 2017. Negrini S, Minozzi S, Bettany-Saltikov J, et al. Braces for idiopathic scoliosis in adolescents. Cochrane Database of Systematic Reviews. 2015;6:CD006850. Scoliosis. American Physical Therapy Association website. Available at: http://www.moveforwardpt.com/SymptomsConditionsDetail.aspx?cid=44c972bb-9690-4505-99f2-0a4c6d1a41a4#.VnBY1L8TDOs. Updated November 18, 2014. Accessed November 27, 2017. Scoliosis in children and adolescents. National Institute of Arthritis and Musculoskeletal and Skin Diseases website. Available at: https://www.niams.nih.gov/ko/node/2405. Accessed November 27, 2017. 4/1/2014 DynaMed Plus Systematic Literature Surveillance https://www.dynamed.com/topics/dmp~AN~T905359/Choosing-Wisely : Choosing wisely. EBSCO DynaMed Plus website. Available at: http://www.ebscohost.com/dynamed. Updated July 23, 2015. Accessed November 27, 2017.